This little piece of advice is probably the one I give out the most: MAKE IT PAINFULLY SIMPLE for potential clients to find you. Add your business' facebook fan page to the employment section of your personal profile AND be sure to make it publicly viewable. That way every time someone lands on your personal profile, there's a bright, shiny link right up at the top sending them over to your business page. Add a shop link every single time you promote. 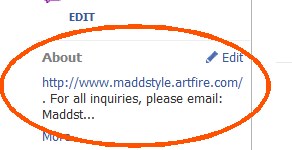 Don't make people click over to your Twitter/Facebook/whatever profile from their news feed to look for the link. More times than not, they won't do it -especially those who get posts on their phones- and you'll be wondering why nobody took advantage of that sale you ran ... somewhere. WRONG: 25% off everything in my shop for the next hour! WRONG: 25% off everything in my shop for the next hour! Just go to my facebook page and click on the ArtFire Kiosk link. WRONG: 25% off everything in my shop for the next hour! Find me on ArtFire at MyAwesomeShop! Provide all of the coupon/sales/promotional information a customer would need every time you post about it. You might actually have a potential customer who just 'tuned in,' after all. WRONG: IMAGINARYWIDGETSALE for 25% off almost all of my widgets this weekend! WRONG: Widgets 25% off this weekend - scroll down for coupon code and terms/conditions. 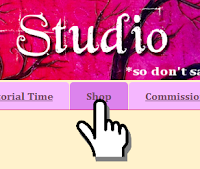 Add your shop link and e-mail to your information/profile section already. Right at the top where people will see it when they visit your fan page. Utilize applications like the ArtFire Kiosk and My Etsy (they can be a little glitchy, but if you can get them to work properly, they're great tools). If people ask for the information you have already painstakingly provided for them (and they will, 'cause there are just TOO MANY LINKS our there screaming for our attention), simply provide them with the link and then tell them where the info is for future reference. WRONG: It's in the side-bar, genius. You can come up with some of your own 'painfully simple' tips by taking note every time you see a link or post and need to link somewhere else or ask someone for the information. Remember, if the info is there but it's buried in text, then it's not painfully simple, is it? The easier you make it for your customers and clients to find you, the more customers and clients will actually make it into your shop! great post!! too often I will look at someones Facebook post showing off something they have for sale and the link is NO WHERE to be found. More than once it was something I would have bought if I were able too. Me too, Barbe! As much as I want to support folks, my A.D.D. (exacerbated by continuously updating news feeds) just won't seem to let me! Give me links or give me... the next post, I suppose.